Oh boy. I am rich in quilt tops. There are currently six tops waiting patiently for me to quilt them (plus one that still needs binding). That means that this week (Spring Break!) should be spent quilting said tops. For some reason I am not looking forward to quilting them. 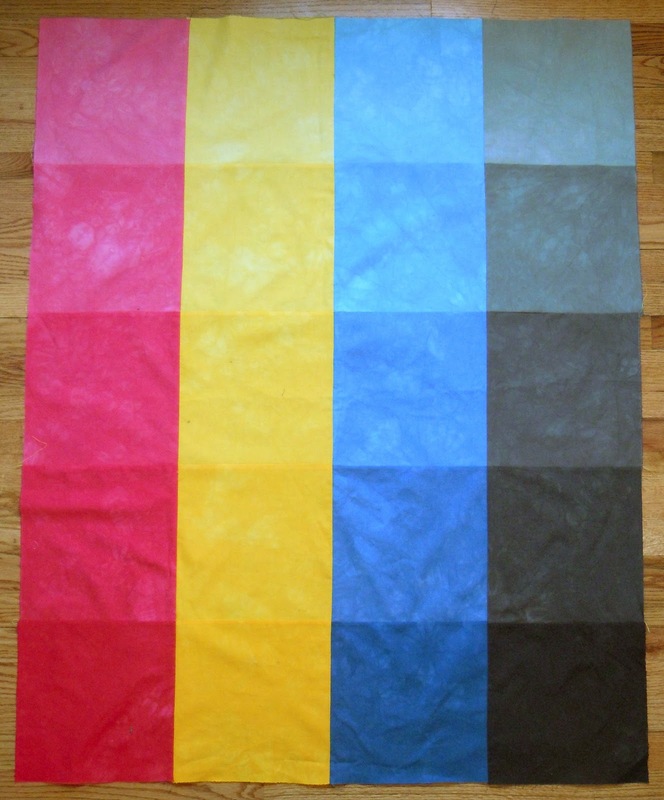 Dyeing the backing fabric and binding, putting together the quilt sandwich, quilting, and binding are my least favorite steps. They're really not that bad and go relatively quickly, but they are just not as exciting as planning, dyeing the fabric, and piecing the tops. 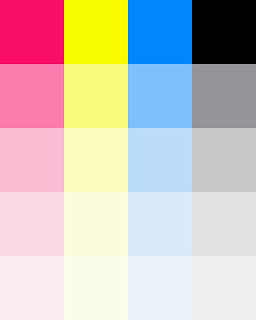 You might remember my plan to make a cmyk quilt? The photoshop sketch is on the bottom, the quilt top on the top. This quilt top was completed last night while watching Jersey Shore with my husband. I know you're jealous of my very exciting Saturday night. 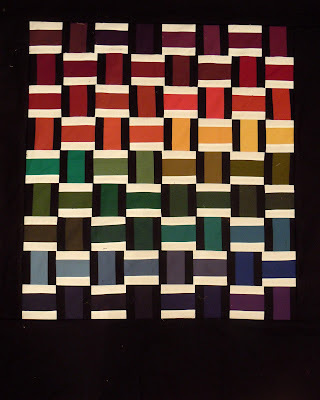 This quilt top is nerdy because cmyk are pure colors but to create the dye colors for the quilt I had to mix 8 different dyes. 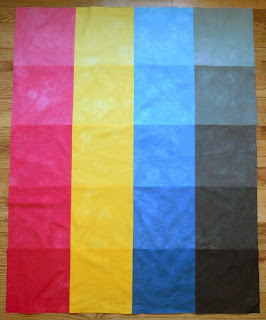 While I was dyeing the fabric I kept cracking myself up becasue I had to create my own primary colors by mixing them. Yes, I am a nerd. And very easily amused. 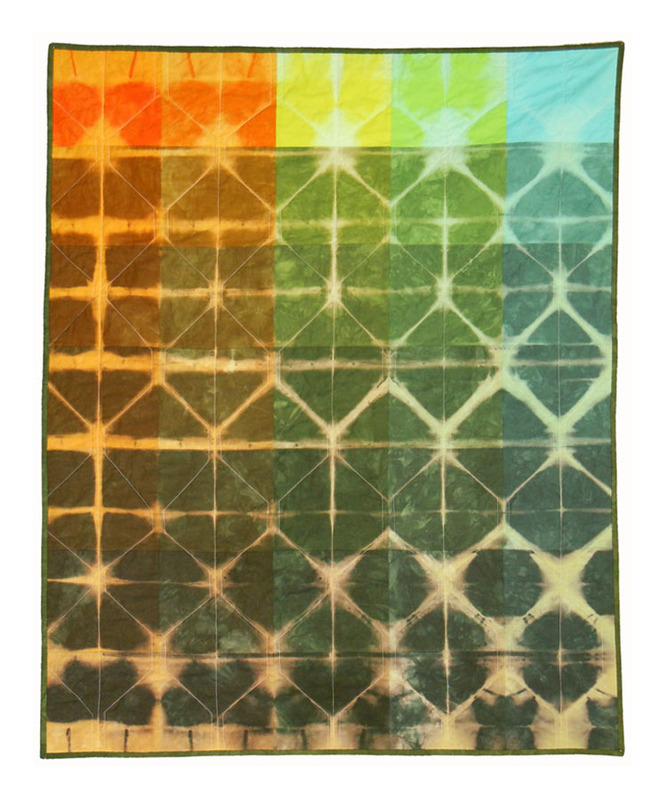 These are two sister quilts. The one on the bottom I made a while ago and is available in my etsy shop. I had left over fabric from this quilt (it was supposed to be twin sized but honestly, I got lazy) and I was inspired by my quilt guild to try some improvisational piecing. The new quilt top was made on Friday. 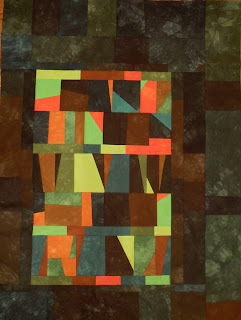 And this is my Robert Kaufman Kona Solids challenge quilt for quilt guild. 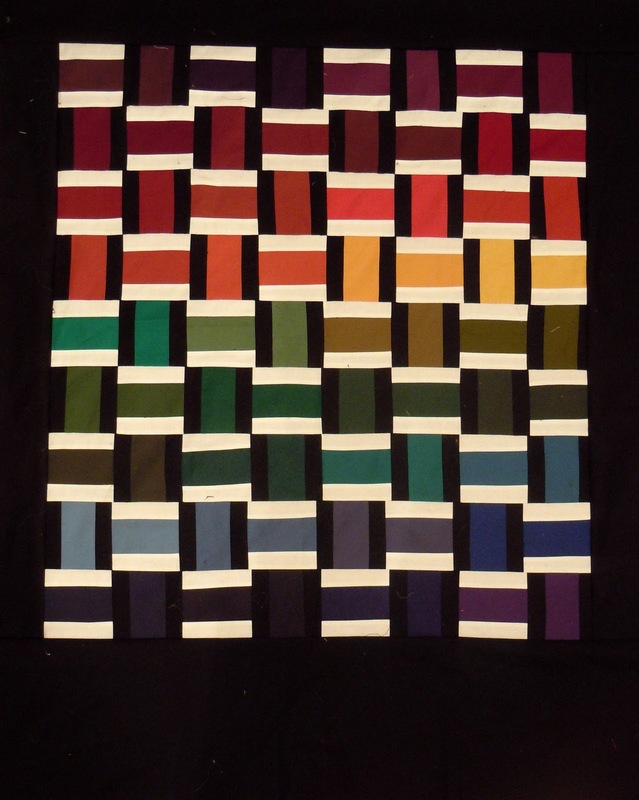 From my charm pack of 43 "darks", I used 36 for the top in a very basic rainbow gradation. The remaining 7 colors will be included in the back of the quilt but didn't fit in my rainbow. This was my first attempt at using only commercially dyed fabric in a quilt and my first attempt at using block construction. It was finished just in time for me to brush my teeth and jump in the car to rush to quilt guild. I'm pretty happy with it.